Twinkling lights and dainty snowflakes, fun window displays and shop doors decked in wreaths – every corner of the Back Bay lets the holidays shine with brilliance. Don the down and get out to enjoy everything this time of year has to offer. Even the toughest Scrooge has trouble mumbling “ba hum bug” when strolling down Newbury and its surrounding streets. Store windows come alive with seasonal splendor to celebrate Back Bay on Display, the annual window decorating contest that adds a welcoming sense of holiday cheer to the neighborhood. 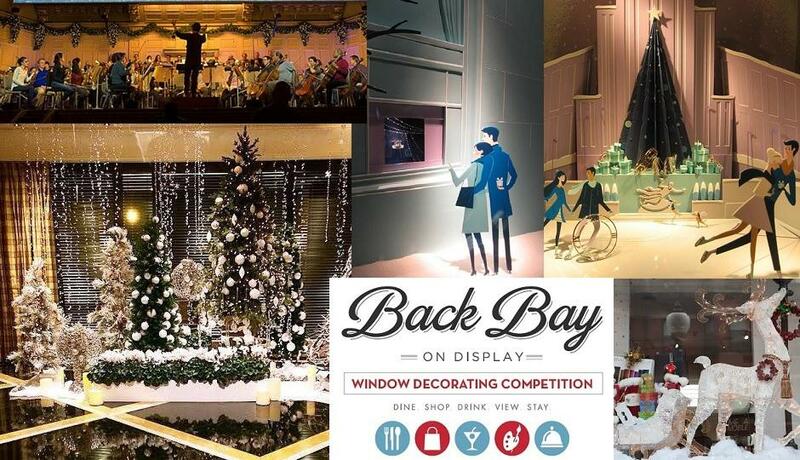 There are lights, poinsettias, and festive notions, and you can vote for your favorite window on Boston Back Bay’s Facebook page until December 22. The photo with the most “likes” will win 2014 bragging rights. From Alex and Ani on Newbury to Williams Sonoma in Copley Place, who will join the ranks of past winners with their baubles and bling, ribbons and bows? When you’re done reveling in exterior frills, step into Back Bay’s shops for some great deals and promotions throughout the month of December. 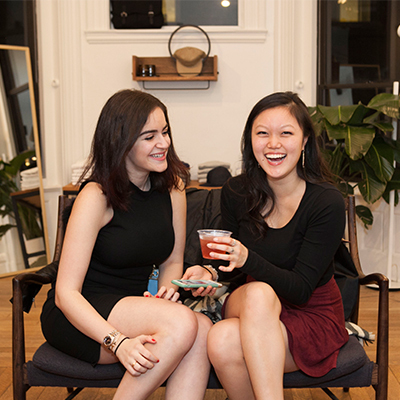 From daily discounts to evening store parties (some with sparkling refreshments and sweet treats), let Boston Back Bay’s Facebook page and BostonBackBay.com be your go-to guides for holiday happenings. 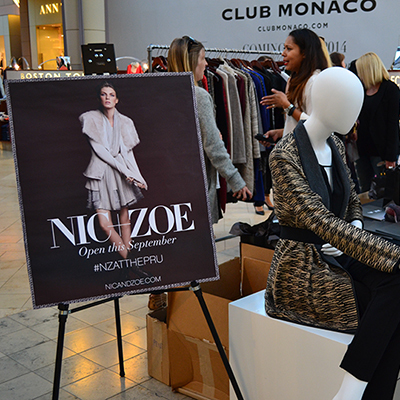 You also won’t want to miss the Cultural Survival Bazaar on December 19 at The Shops at Prudential Center. The Belvidere arcade comes alive with Native performers, art, jewelry, clothing, crafts, and décor, perfect for crossing unique gifts off your list. With shopping bags in tow, take a moment to escape the winter chill with a piping hot cup of chocolate at LA Burdick, Met Back Bay, or Max Brenner. Every December Saturday from 1 to 4pm, you can sit fireside at The Avery Bar at The Ritz-Carlton, Boston Common and sip on cocoa topped with candies, cookies and creams. Kids also delight in decorating their own gingerbread men. The season wouldn’t be complete without a visit from Jolly Old St. Nick. The beloved man in red hits the town at The Shops at Prudential Center’s annual Santa in the City. Until Christmas Eve, you and your kiddies can capture the magic of the holiday complete with a special photo with Santa in his winter wonderland. Get yourself selfie ready for a December calendar of parties with the beauty experts at Back Bay’s award-winning salons. Think glittery lash extensions at Lash L’Amour, blow out styles at Drybar, or award-winning color at Patrice Vinci Salon. Or treat yourself to a deep tissue massage at G2O Spa for stress-busting and unbunching shoulders tired from carrying all those packages. The holidays are a great time to gather friends and family to settle into the season with theater and music. Through the Mayor’s Holiday 2014, BosTix is offering half-price tickets to more than 100 of the region’s most beloved seasonal performances. From ballets to theater, sing-alongs to symphony, revel in the festivities all over Boston, such as the Back Bay Chorale’s A Candlelight Christmas on December 13. The choir is joined by organ and brass for an evening of holiday favorites, both traditional and modern at Emmanuel Church. A special gift to you – there will be two hours of free parking at various meters throughout downtown Boston on December 6, 13, and 20. It seems the city thinks you’ve been good this year. 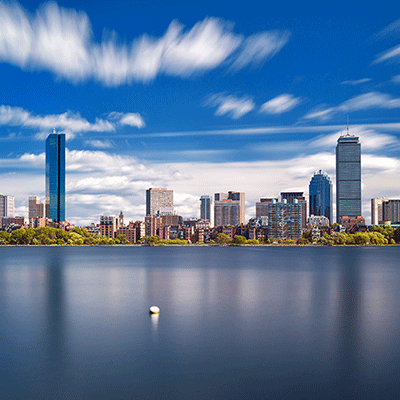 Take advantage of the yuletide and enjoy the Back Bay this holiday.